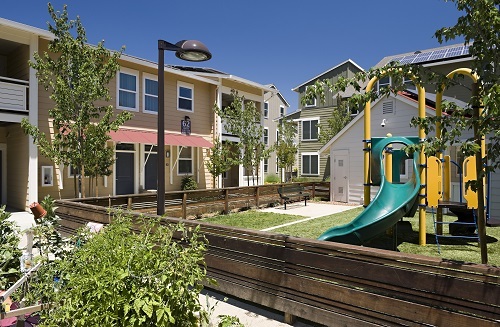 Foss Creek Court, developed by Eden Housing, is a GreenPoint Rated low-income housing tax credit project in Healdsburg, California. Image courtesy of Jeff Peters, Vantage Point Photography Inc. A significant portion of newly constructed affordable multifamily rental housing is developed using low-income housing tax credits (LIHTCs). Green building practices, including siting and designing buildings in accordance with smart growth principles and using environmentally friendly features such as energy- and water-efficient fixtures, have the potential to improve this large stock of affordable housing by reducing operating costs, promoting resident health, and mitigating negative environmental impacts. On February 24, 2014, the U.S. Green Building Council, the National Housing Conference, and Enterprise Green Communities hosted a forum, How Green Is My Housing Credit: Proven Results From Green Rental Housing, to discuss the methods and benefits of incorporating green building into LIHTC developments. One point of discussion was the cost of adding green features to affordable housing developments under the LIHTC program. Green features can increase the upfront costs of both new construction and rehabilitation projects. At the federal level, the LIHTC program does not mandate green building standards for its affordable housing; however, the IRS code specifies that each state consider energy-efficiency in its own additional requirements for LIHTC developments. State agencies receive a set amount of tax credits from the federal government based on the state’s population, and these agencies distribute them to developers according to a qualified allocation plan (QAP), which may require that projects include green building components to be eligible. A recent study of QAPs concluded that many states have taken additional steps to promote energy-efficiency, smart growth, resource conservation, and health protections in affordable LIHTC developments — in particular, by requiring that LIHTC developments meet the standards of third-party green building certification programs such as Leadership in Energy and Environmental Design, GreenPoint Rated, or Enterprise Green Communities. Panelist Linda Mandolini stated that in California, obtaining certification through a green ratings system makes the project eligible for LIHTCs, but to make their projects competitive for available funding, developers often need to include additional green features. Because states often require developers to include green features in their developments or follow green building standards to obtain LIHTCs, the costs of these green features are often not considered to be in addition to those of conventional building features, but rather built into the total construction cost. 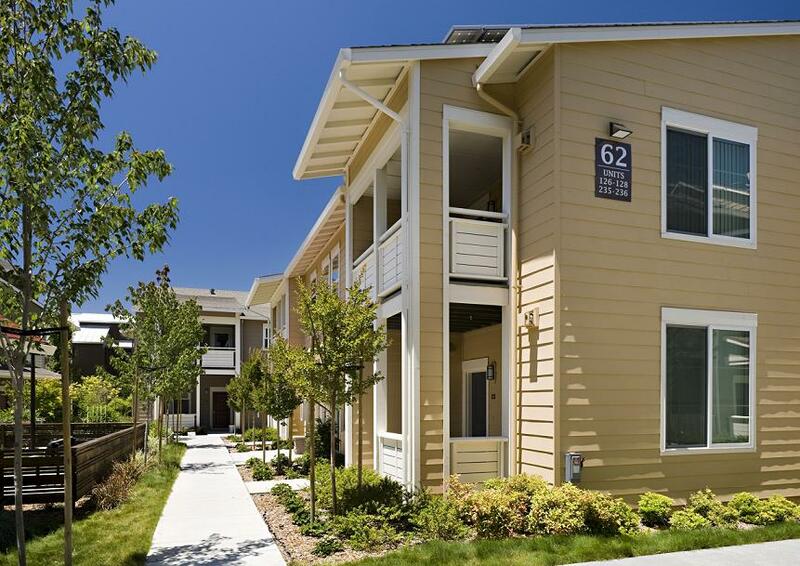 Foss Creek Court’s green features include a high-efficiency irrigation system, drought-tolerant landscaping, and photovoltaic panels. Image courtesy of Jeff Peters, Vantage Point Photography Inc. According to panelist Mark James, some green features can be included as a depreciable cost in the LIHTC eligible basis, which would make a project eligible for a higher level of LIHTC subsidy to help defray the cost (developers should consult state tax credit allocating agencies to determine whether green features can be included in the eligible basis for LIHTC projects). Although not all green features can be included in the basis and thus receive a subsidy, cost-effective improvements will generate sufficient utility cost savings to exceed upfront costs and benefit the owner within an acceptable payback period. Another point raised in the discussion was the importance of selecting the most appropriate green components for a project. Although developers must consider how green features will contribute to a project’s eligibility or competitiveness for LIHTCs, panelist Michael Jerabek stressed that developers should also evaluate each green feature in light of its contribution to overall energy performance and sustainability. Forum panelists emphasized the need for energy audits and energy modeling to determine the most effective green features for reducing overall energy use. Some states require developers of rehabilitation projects to use a HERS rater to conduct an energy audit. Even in cases where a HERS rater is not required, developers should find a knowledgeable and experienced professional to conduct audits, create energy consumption estimates, and install green features. James recommends selecting certified energy auditors or energy modelers with good references, and he suggests subcontracting the green elements of a project to a reputable firm if the general contractor lacks experience with those specific green components. Selecting a certified professional is important, as forum panelists noted that the most cost-effective green components may not be the most obvious ones. For example, Mandolini remarked that although solar power features are a popular green building retrofit, improving insulation can be a more cost-effective and energy-efficient retrofit for older buildings. Even with professional help, identifying which green features are appropriate for each development necessitates a learning process. Many issues with green features arise after the development phase ends and operation begins. Each panelist identified an issue with green features that a development had encountered in operation, ranging from difficulty maintaining drought-tolerant landscaping to a geothermal pump that used more energy than expected. Recognizing such issues, as well as comparing pre- and postretrofit energy costs for rehabilitation projects, helps inform and improve subsequent projects. The success of green features and green building practices, in terms of energy and money saved, also depends on residents and building management. Forum panelists underscored the need to educate residents about green features, whether through a video, a tenant manual, or newer technology such as a mobile app. Although requiring tenants to pay for their own utilities can encourage residents use green features, offering incentives, such as rewards for meeting energy reduction targets, can also persuade tenants to take advantage of green technology. Helping property managers understand the benefits and maintenance needs of green features is also important so that they can continue to promote these features long after the developer has moved on. The forum closed by highlighting the role that healthy, affordable housing plays in improving residents’ quality of life. As a popular source of funding, the LIHTC program has the potential to encourage large-scale development of healthy, sustainable, affordable housing. Although green features and green building practices increasingly are being incorporated into state regulations for the LIHTC program, developer choices can affect how sustainable and successful individual projects will become. Using the advice and lessons of other professionals in the field can help developers better integrate green features and building practices into LIHTC developments and ultimately improve low-income residents’ quality of life. Michael Jerabek, Partner at Worn Jerabek Architects, PC.